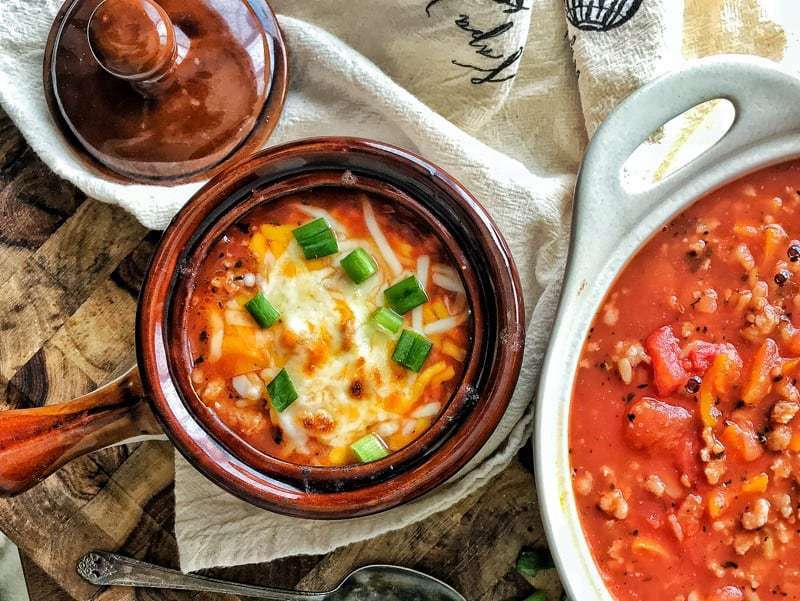 A healthy stuffed pepper soup that takes just 20 minutes. Loaded with veggies, packed with flavor, this soup is a great way to get your family eating more veggies. Thanks to Produce For Kids for sponsoring this post. As always, all opinions are my own. Raw sweet peppers are a food my kids don’t willing eat. I’m not sure why. Peppers crunchy texture paired with their light flavor, make them the perfect dunking veggie. I’m 11 years into trying with one child, and 9 the other, and they are still not on board. What is a mom to do? I say —> cook the peppers. Years back, I started buying red and green peppers in bulk at farmers markets when I could find them at a great price, I’d chop them and freeze them. Freezing bell peppers is a great way to have veggies available year round to toss into recipes such as soup or casseroles, adding extra nutrition to meals. Wash peppers, remove stem and seeds. Chop peppers into small bite-sized chunks. Arrange peppers on a baking sheet in a single layer. Freeze. Once frozen, move peppers to ziplock freezer bags. Label. Unblanched peppers can be frozen for up to 8 months. A couple of months ago, I thought I’d try my hand at a stuffed pepper recipe. I wanted to see if the fun presentation would work to get my kids eating peppers. Baked stuffed peppers helped get one of my kiddo’s on board, but they weren’t the solution I was looking for. Enter record-setting below zero temperatures – 15 days straight. Soup is in full play and I wanted to try something new. With a freezer full of chopped peppers, some seasoned pork sausage needing to be used, I figured I’d try my hand at a stuffed pepper soup recipe. 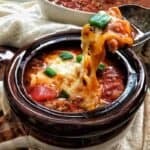 How did this stuffed pepper soup recipe go over with my pepper fearing family? Fantastic! My daughter couldn’t stop talking about how delicious dinner was – and let me tell you, this rarely happens! My son scarfed down his bowl almost before I had time to start eating. A meal success. I hope your family enjoys as much as mine did! If you’re like me, you have a freezer filled with chopped onions and peppers. Pull these out, saute with ground pork, add the rest of the ingredients, and dinner is ready. 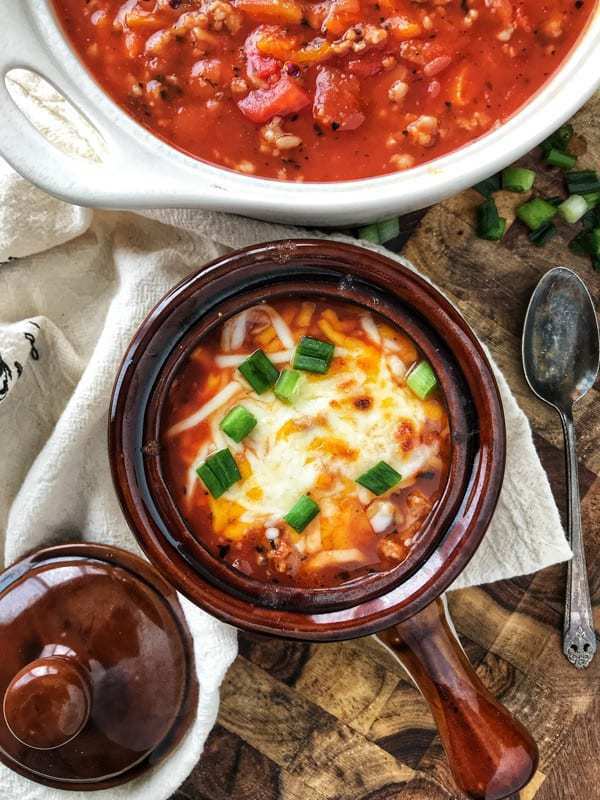 A simple stuffed pepper soup that is low in calories but not lacking in flavor. A delicious soup recipe that comes together in just 20 minutes. In a large stockpot, heat olive oil over medium-high heat. Add peppers and onions. Cook 5 minutes, or until translucent. Add garlic, cook 1 minute. Add seasoned pork sausage, adjust heat if needed, cook until meat is browned. Drain. Add basil, salt, and pepper. Cook 1 minute, or until fragrant. Add tomato sauce, diced tomatoes, and chicken stock. Bring to simmer over medium-high heat. Preheat broiler before sauteing vegetables. 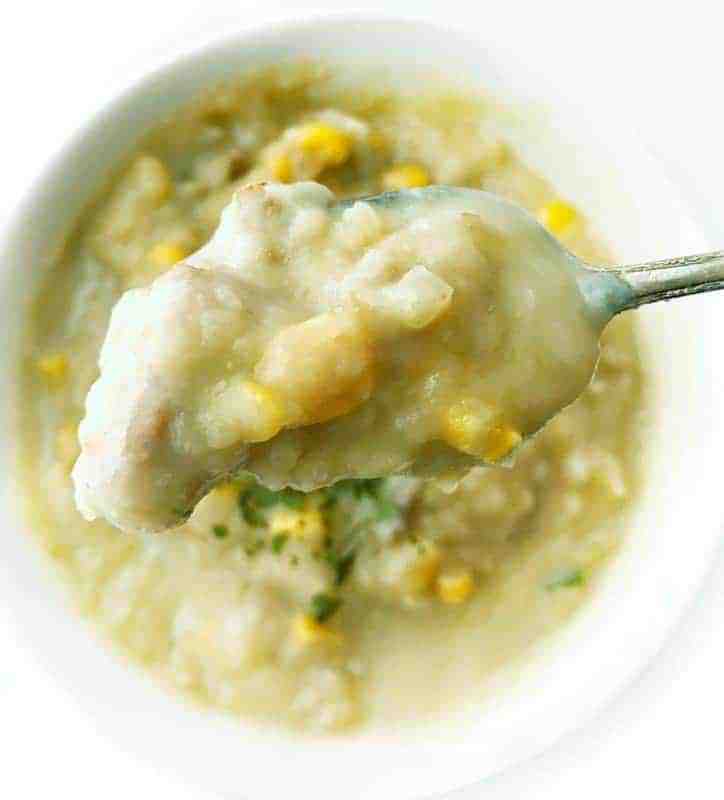 Ladle soup into individual oven-safe soup bowls. Top with shredded cheese. Broil 2- 3 minutes, or until cheese starts to bubble and turns golden brown. Garnish with chopped green onions. Serve immediately. 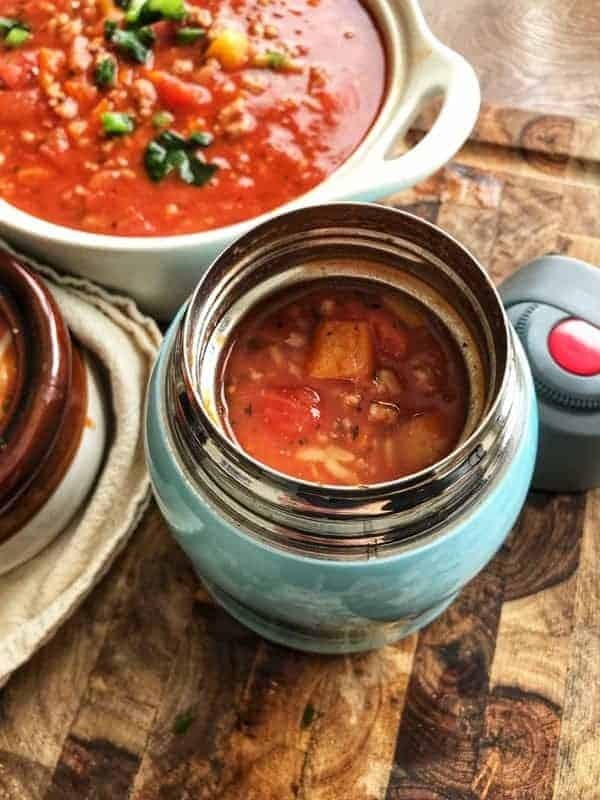 This soup would be a delicious addition to your child’s lunchbox – thermos’s work great for adding variety to those school lunches! I love the Miu Thermos. It’s great for older children or adults as it holds more than a smaller child-sized thermos. You can find this thermos by clicking here. This is an affiliate link, which costs you no more, but I would get a small commission on any purchases. This recipe comes in at $2.02 per serving with higher priced peppers in the offseason. 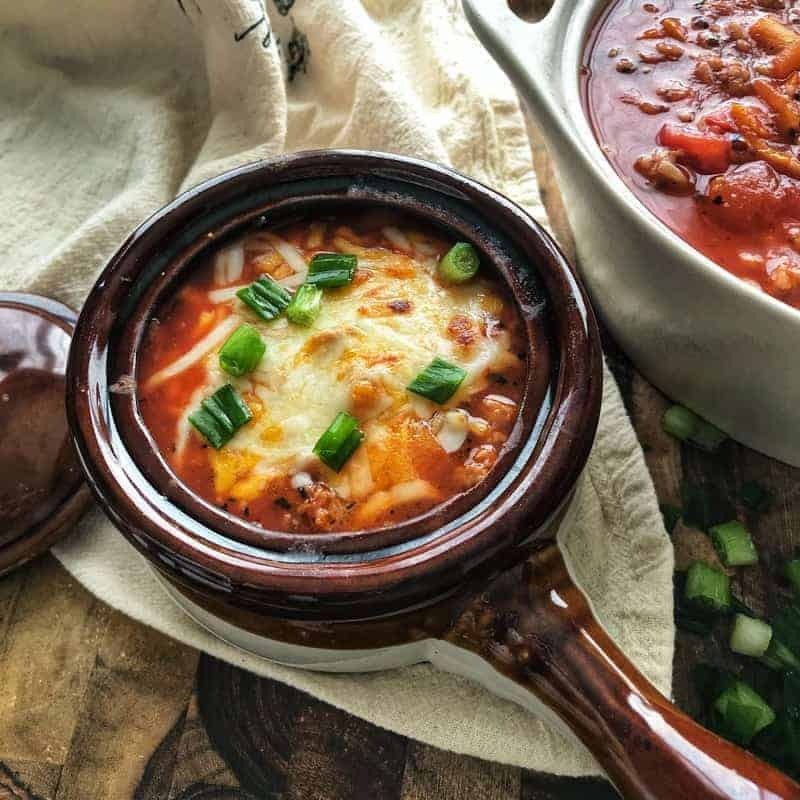 Stuffed Pepper Soup drops to $1.33 per serving with cheaper peppers during their growing season or when you can purchase peppers at a lower price. 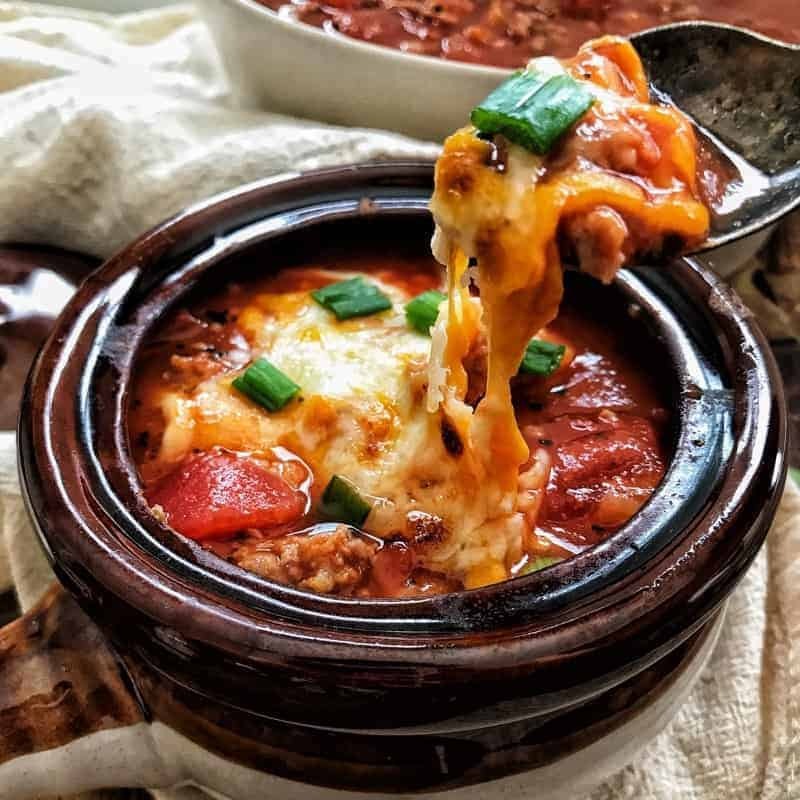 Looking for stuffed pepper recipes? Check out yummy pepper recipes from Produce For Kids by clicking here! I have actually never tried freezing peppers (and I freeze LOTS of things). Thanks for the tip! Looking forward to giving this soup a try! That broiled cheese got my kids eating another bowl! Fantastic! So easy to make and lots of flavor. The whole family LOVED IT!